In an effort to help promote Formula One to the US audiences, our F1 drivers tried all kinds of weird and wonderful hobbies in the build up to the race. 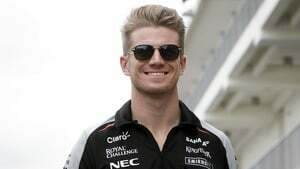 Hülkenberg decided being a cowboy was the way to go, Hamilton did the TV circuit, Grosjean turned to food, and Ricciardo, well he practiced doing the accent instead. All of these things are pointsworthy and there's plenty more besides. If you've spotted anything any of the drivers are doing that could be worth a point or two, don't forget to let me know. We're getting ever closer to the end of the season and it's a heck of a battle to the finish! +1 Lewis Hamilton: Mixed feelings about this one. Another dodgy sponsorship campaign but points for effort from Lewis. However, not many because oof, I dislike the concept of getting covered in paint or whatever the heck that is. +1 Daniel Ricciardo: Daniel has gone for the cowboy hat rather than the boots. +1 Lewis Hamilton: Points, as demanded by Mr C, for plugging the US GP concert line up, including of course, Ms Taylor Swift. -2 Pascal Wehrlein: Cheeky little fella ignoring his engineer's request to turn off the engine, despite him asking at least five times! +3 Nico Rosberg: Channelling his inner Bon Jovi for a spot of post-race singing. Choooon! +1 Fernando Alonso: Cute that he has dinner with his protégé Carlos Sainz after the race in the US. +1 Carlos Sainz Jr: Sharing a dessert with Fernando Alonso after the race in the US. +1 Jolyon Palmer: Quite nice that he apologises for moaning on the radio during the US GP. +3 Lewis Hamilton: Doing a really good job plugging F1 on The Ellen Show, explaining its intricacies well. +1 Daniel Ricciardo: Not learning his lesson with the whole accents debacle but also making up words! +3 Nico Hülkenberg: Some excellent cowboy skills on display here: boots, hat, rope, job done.